I really felt that since this was our first visit to Reykjavik, and to RIFF, that I should talk about some of our experiences outside of the films themselves. In fact, we had some of the best and worst experiences of the festival when we weren’t at regular screenings, and these stories are worth telling, at the very least for posterity, but also in the hope that they’ll help the RIFF organizers fine-tune their festival to make it better for international visitors and journalists. I’d say that first and foremost we were taken aback a little by the overall character of Icelanders themselves. Though I’d been warned a little bit by my new Icelandic friend Alda that Iceland didn’t possess much of a “service mentality,” I was still under the impression that Nordic countries were all very disciplined and organized. I’ve visited Norway, Sweden, Finland and Denmark and have found that assumption to be generally accurate. Not so in Iceland. The best way I can put it is that Icelanders possess a combination of self-reliance (not surprising considering that for most of their history, they were a rocky and barren outpost dependent on fishing) and bohemianism (everyone is an artist, musician or filmmaker, and often more than one) that makes them completely unique. Unfortunately, it also makes them a little bit indifferent to what visitors might want or need. I’m hesitant to provide the following examples for fear of seeming ungrateful, so I’ll post a disclaimer first. RIFF was incredibly generous in providing press accreditation to both me and my wife, and everyone we met was friendly. But there were a number of failures of organization which, for a festival in its fifth year, are a little hard to understand. Though we were accredited as press, there didn’t seem to be any sort of press centre in evidence, nor was there someone functioning specifically as a press coordinator. We weren’t contacted to set up interviews with filmmakers, nor was there any opportunity outside of regular screenings to see the films. Though there were only three venues for screenings, the programme neglected to provide any sort of map. We ended up seeing films at only one location since it was the only one we could find. Our experience in trying to locate one of the others, the Nordic House, will illustrate: After a late dinner, we attempted to get to a 10:30 screening of Guy Maddin’s My Winnipeg. On the map provided by the tourist office, it looked like a fifteen minute walk. After walking for more than half an hour and finding ourselves in the middle of what looked like a deserted office park, we gave up. Some sort of signage or guidance would have helped. The tiny schedule printed on the back cover of the programme was far too small and cramped to make much sense. To make matters worse, on some days the scheduled screenings were half an hour earlier. But when we showed up early, we were told that because of the confusion, they’d have to start at the later time. We weren’t clear if that was an adhoc decision or was now policy. Two of the films I saw were projected in the wrong aspect-ratio, squeezing what should have been lovely widescreen images into a TV-shaped frame. Volunteers didn’t seem to have answers to our questions. The head volunteer at one of the major ticket outlets was a British woman who spent more time making cracks about Icelanders than providing any useful information. I have two stories about one of my most-anticipated events, a screening of Danish silent film Sons of the Soil (1920), the first feature ever filmed in Iceland. Up-and-coming Reykjavik band Hjaltalín had written a score and were scheduled to perform it as live accompaniment to the film. Since this was a special event, there was a charge of 2000 kronur (about $23 at the time) for tickets. 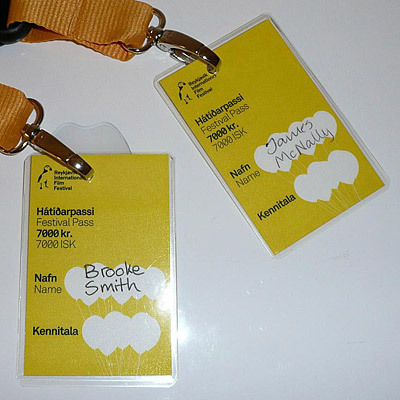 When we first attempted to buy tickets, a week before the show, we were offered tickets to the film screening (at 900kr), which our press passes gave us free acess to. Then the above-mentioned British woman scolded the Icelandic volunteer and said tickets weren’t actually available there, and that we’d have to buy them at the venue. But what to make of 900kr tickets to a 2000kr concert? There was no other screening of the film scheduled. About two days before the concert, we were finally successful in purchasing our tickets at that very same ticket desk. I was a little dismayed to see the numbers “003” and “004” on them, but at least we had them in hand. We’d read in the programme that buses would be dispatched to take us to the concert since it was at a different venue, simply listed as “Bæjarbíó” with no address given. Though the tickets stated the screening started at 8:00pm, the promised buses were also scheduled to pick us up at 8:00pm across the street from the bookstore where we’d purchased tickets. When we asked the British volunteer chief, she assured us that buses would be there and that film festival volunteers in their yellow t-shirts would be there to help us. Being cautious, we showed up at about 7:45pm but couldn’t see any volunteers. The weather was too cold to be standing around in t-shirts anyway, but no one appeared to be around, neither volunteers nor other people waiting for the bus. Worst of all, there was no bus, even by 8:10pm, when we decided to hail a taxi. After showing the driver the tickets to see if he knew where to go, he had to call his dispatcher, which is never a good sign. After that he happily set off for the southern suburb of Hafnarfjorður, where we’d spent that very morning in our rental car, looking around. 3000kr later (about $35), he dropped us outside of a building we’d walked past that very morning. My temper was beginning to boil. As we walked into the theatre at about 8:25, we spotted Yung Chang, director of Up the Yangtze (review), whom we’d met the night before, and I made a note to find out how he’d gotten himself there. Since we were late, we had to take seats in the second-to-last row and as we settled in, we could hear a man giving a rather lengthy introduction to the film only in Icelandic. Then the band came out and the film started. We had no idea what the running time of the film was, but I was treating it like a concert, so expected about 90 minutes or so. Nearly three hours later, we emerged, dazed and confused. There were no English intertitles for the film, which seemed to have several false endings. The score, though beautiful in stretches, was discordant in others, and simply score-like for most of the rest. We headed outside hoping to see a bus, and were not completely surprised to see none. I was able to find a volunteer and asked where it was. She had no idea and went to find her supervisor. “Oh, it’s not out front?” she asked me. “Let me go and find out.” After finding and asking the festival director without success, she wandered off across the street. Luckily for us, Yung offered us a ride back to Reykjavik with his Icelandic friend Hana, and we gladly accepted. I still don’t know whether any buses existed. Earlier in the festival, there had been a drive-in scheduled to take place in the parking garage of a local mall. Though the listing was duly translated into English in the guide, I noted that both Icelandic and English text said the audio would be broadcast over the car radio on the 91.9 frequency. Though the guide promised that all films would be screened in English or with English subtitles, I also noted that one of the features of the drive-in would be the season premiere of a popular Icelandic television show. Suspecting that there might not be any English translation available, I sent an email with my question to the festival’s guest coordinator. I also mentioned our confusion with the Hjaltalín concert tickets. Three days later, I got an email thanking me for my message, which she would “get to later” and then inviting us to a dinner sponsored by the Icelandic Film Centre that evening. I never did get any reply to my questions. Whew. I didn’t intend for that to be as long and ranty as it turned out. If you’re still with me, I don’t want to give the impression that we didn’t have any fun. In fact, the best times we had were at a number of smaller events that we were specially invited to. For those, I’d like to specifically thank the Icelandic Film Centre (in particular Thóra Gunnarsdóttir and Laufey Guðjónsdóttir) who have always seemed nothing but professional in my contacts with them. Brooke and I were delighted to be invited to a “sneak peek” event early in the festival where we met several Icelandic directors and saw clips of upcoming releases. This was held at a beautiful restaurant with a lovely view of the harbour. I think we may have been among the first to see the trailer for Júlíus Kemp’s Reykjavik Whale Watching Massacre, which looks to be a scream (literally). We also saw clips from Sunshine Boy, an upcoming documentary about autism by Friðrik Thór Friðriksson, perhaps the godfather of Icelandic cinema. Steeled by some free wine, we actually spoke to several directors we’ve been fans of for a long time, including Friðriksson, Baltasar Kormákur (101 Reykjavik, Jar City (review)), Valdís Óskarsdóttir (Country Wedding (review), and editor of Eternal Sunshine of the Spotless Mind and many other “Hollywood” films), and Icelandic author Andri Snæer Magnason, whose bestseller Dreamland: A Self-Help Manual for a Frightened Nation is being made into a documentary. When we left, we were presented with a gift bag full of DVDs of Icelandic films as well as press material for the upcoming films we’d seen previewed. 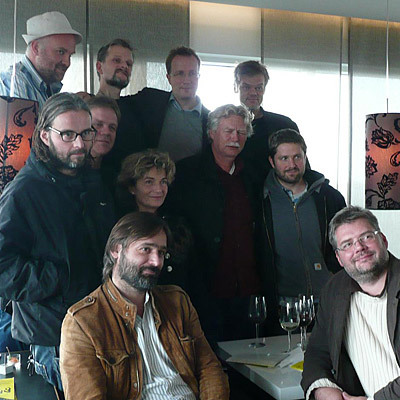 Later in the week, as I mentioned above, we were invited to an intimate dinner where we were among not only the Icelandic filmmakers but all of the international filmmakers and guests who were at the festival. At our table of ten, guests included Friðrik Thór Friðriksson and Canadian actress Arsinée Khanjian (serving on the jury). Scattered around the room were Costa-Gavras and his wife, Finnish documentarian Arto Halonen (Shadow of the Holy Book (review)), Faroese filmmaker Katrin Ottarsdottir, Irish documentarian David Kinsella, Canadian documentary filmmakers Gwen Haworth (She’s A Boy I Knew, awarded a Special Mention at the Queer Cinema Awards in Reykjavik) and Yung Chang (Up the Yangtze), and Dimitri Eipides, programmer for RIFF, TIFF and the Thessaloniki Film Festival. A delicious meal of Icelandic lamb was followed by drinks including Brennivin, the legendary schnapps nicknamed “Black Death.” A good time was had by all. At the dinner, we met RIFF director Hrönn Marinósdóttir, who made sure we knew about the closing party which was being held aboard a whale watching boat in the harbour on the final Saturday night of the festival. In fact they had attached three boats together to accomodate everyone, including the boat that Brooke and I had gone out on the week before. There were many more people there, undoubtedly attracted by the open bar and the interesting location. There was a DJ (and our new friend Yung Chang even jumped in and played a DJ set off his laptop) and it was definitely a young and local crowd. The festival handed out its awards and later, we spotted Björk in the crowd. In fact, we were probably within a foot or two of the pixielike singer, perhaps Iceland’s greatest export. In this context, Icelanders’ lack of formality was actually a benefit, since nobody seemed to treat her too much like a celebrity. All in all, we had a wonderful time, and spent quite a few of our days driving around the countryside seeing the sights. I’ll look forward to seeing how RIFF matures, and would definitely be interested in coming back again soon. Next time, I’ll just carry a better map! This entry was posted in Film Festivals, Travel and tagged iceland, reykjavik, RIFF. Bookmark the permalink.